This small but powerful machine has been specifically engineered for applications with limited space or budget. The 324HD Series has all of the important safety features that make us the leader in the vertical baler industry. PTR Baler & Compactor offers the highest quality, most reliable Vertical Hydraulic Balers on the market today. Our baler models are versatile, durable and great for a variety of different markets. They are excellent for disposing of a high volume of cardboard and dry waste, thereby keeping floorspace clear. 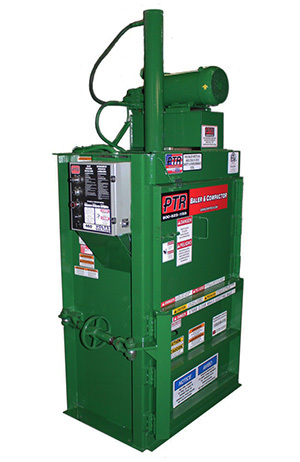 PTR's Vertical Balers enable your company to reach it's recycling and sustainability goals. We offer the most efficient and durable balers available. They are ideal for large hospitals, industrial facilities and distribution centers. Every baler safely and easily bales high volumes of discarded materials like cardboard, plastic P.E.T. bottles, aluminum cans and siding. After purchasing your Vertical Baler from PTR, we provide the most reliable, expert maintenance and repair service in the industry.